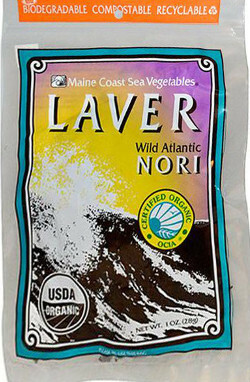 Maine Coast Sea Vegetables Laver Whole Leaf 1 oz. Nutritionally, Laver is the highest in Vitamins B1, B6, B12, C and E of all the sea vegetables we carry. It also contains significant amounts of vegetable protein, fiber, iron and other minerals and trace elements. Maine Coast Sea Vegetables is committed to the rediscovery of this ancient food source from the sea. Their mission is twofold: to provide high-quality North Atlantic sea vegetables as user-friendly foods and to build long-term relationships with their suppliers and the environment. To bring out more of its nutty, sweet flavor, lightly roast the Laver in a skillet or low oven until slightly green. It can be crumbled and sprinkled into soups, salads, pasta, potatoes or any dish needing a subtle, salty sea taste.